While my outfit was more or less the same as last year (I’m thinking about mixing it up a bit for future rides), I did make some signs for the bikes this year. This year’s temps were quite a contrast to last year, when it was chilly even before the sun went down. Turns out ninety degrees and humid isn’t too bad when you’re biking [mostly] naked, and after wondering all day if the ride would be rained out, I wasn’t complaining. We had a few new friends join us for the ride this year (including Rebecca over at Fiets of STyLe), and it was fun to experience the ride with them. The route provided a really wonderful look at a number of St. Louis neighborhoods, and the 12 miles seemed to fly by (though we weren’t going all that fast, of course). While passing by some hotels in downtown St. Louis, one of my fellow riders shouted [to some tourists], “Welcome to St. Louis. We just do this spontaneously every Saturday night,” and I rather wish that were the case. I was sad when I realized we were almost back to The Grove (the ride’s start/end point), especially because, similar to last year, the ride itself was definitely the high point. We did hang out for a bit afterward, and ran into some other friends, but we made it a pretty early night (maybe the after party was more exciting after 10pm?). On Sunday, G made a strong case for participating in next year’s festivities by running around the apartment wearing a cape and a mask . . .
. . . and not much else. There were a couple of other little ones there last night, and I’m very tempted to bring him next year, at least for some of the pre-ride festivities. Pretty sure he’d steal the show, riding around on his balance bike in that cape! *Now that I look closely, the blue tutu glimpse on the KSDK website is me, but it’s a photo from the 2013 ride. I’m wearing my [old] yellow helmet (helmet now is white), and there are no signs on my bike. Guess they didn’t send anyone to cover this year’s ride? 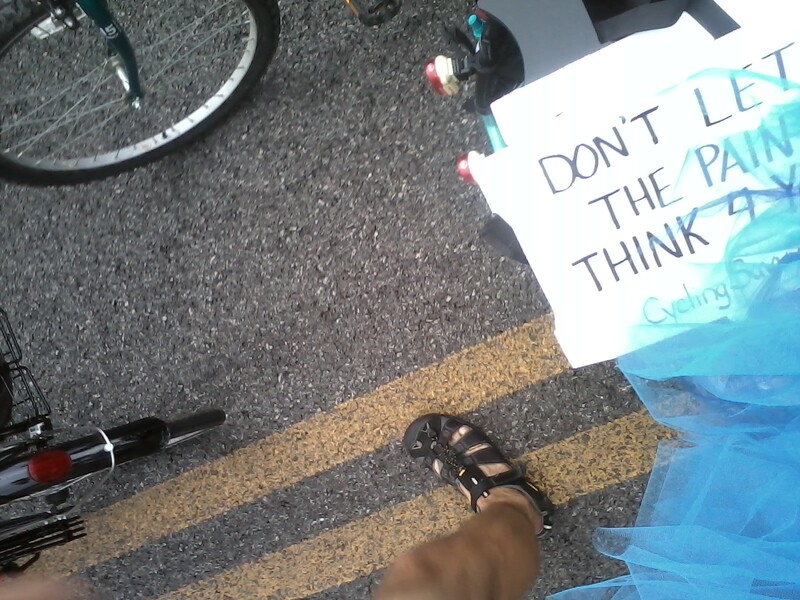 This entry was posted in Biking and tagged StL, World Naked Bike Ride. Bookmark the permalink. Ah! That photo was confusing to me as well, because I should have been at least able to pick out part of my bike, or a foot, since we should have been right next to one another. Weird and sneaky, KSDK.